I spent a lot of time one weekend writing. I was working on my first eBook and had a lot of words to get out. That said, I had a lot of other things to do, too, and I also just couldn’t get my head into the game. I used the timer on my oven, you may want to pick up a cute kitchen timer, or you can use a timer on your phone, if it is easy to set it to varying time increments. Sorry, I got distracted looking at fun kitchen timers. You’re welcome. Pick which task will be the longer one, requiring focus for more of the day, or more time to complete. Then, work on it for twenty minutes. Work on nothing else. You are not allowed distractions. Put all of your effort into getting this task going. For me, that was writing. It took a while to get my head in the game, but by the end of the first twenty minutes, I had some flow going. For ten minutes, work on a smaller job, like a chore. Ideally, pick something that doesn’t take all of your mental efforts, like unloading the dishwasher. This way, your brain is still allocating some horsepower to the larger task at hand. The beauty of ten minutes is that it is long enough to get some things done, but short enough that you can stand to do a task for that length of time. For me, the perfect task is putting away laundry. I hate doing that, but I know if I can get it all done within the ten minute window, it will be OVER. Normally, I get distracted and find other things to do and it only ends up partially done. When the timer goes off again, switch it back to 20 minutes. Return to the big task and focus intently for another twenty minute block. Spending 1.5 hours using this productivity hack, you will have spent half an hour on chores and one hour on your main project. Your time will be more focused than if you had sat down to spend a full hour on your main project, so overall you will get more done in the same amount of time. The nagging feeling that you need to do some other task, say clean your dorm room during exams, is completely abated, because you can do that nagging task, without letting it balloon into a giant waste of time. Additionally, you give your brain time to ponder things, when you are switching back and forth between tasks. Every once in a while, you will be so into the task at hand, that you decide the beeping can be ignored and you’re just going to plow on through. After two hours of doing this, if not more, there is a definitive list of things you have completed. This is in part due to the tendency to pick tasks that can actually be accomplished in one to three 10 minute blocks. Regardless, it leaves you with a sense of accomplishment and most of the time, a visual indication that you have got things done. Assuming your house is remotely similar to mine, I had absolutely no trouble at all coming up with things to do for my 10 minute chore brakes. In fact, I had a monstrous list. I really hate folding and putting laundry away… but I could push through for 10 minutes. 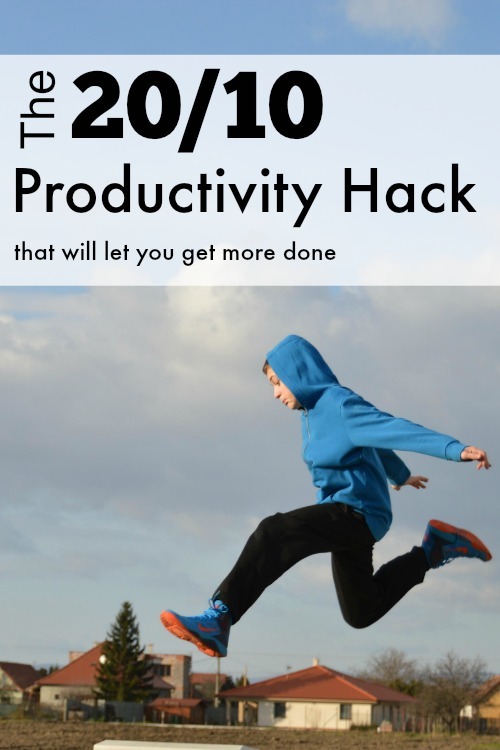 Is the 20-10 Productivity Hack Revolutionary? No. Me too. The world is much too shiny! Oh neat! You did it all in one block then? I would like to have that kind of focus, but I really don’t. The internet is SO shiny! Let me know if it works out for you. I think I would really, really struggle working from home full time, always thinking I needed to do other things. I know exactly what you mean! I used to also use a rule where I wasn’t allowed to sit down for the first fifteen minutes when I got home, because if I did, I never got back up again. Maybe give that one a go? I need to start implementing something more structured like this. My son does great with timers around his homework and play time, that it’s probably something that will work for me as well. Oh interesting that you use them for him. I know a lot of parents use them for screen time. I go through spurts of using this technique and find it extremely useful. Yes… especially when you’re working on the internet! Buzzfeed, anyone? We might have to give this a go during the week, the many hour long cleaning sessions on our weekend (read: days off) need to stop! yes! We go through periods of trying not to do many chores on the weekend… but can never get our butts in gear on week nights. Cool! I think this works for activities that you really find hard to complete.. It keeps me motivated on the hard ones for sure. Did you find switching out of your bigger task every twenty minutes interrupted your flow when returning back to that task? Surprisingly no! There are usually only one or two times where I will keep going with the big task after the timer goes off because things are flowing really, really well.